I love mine! I emailed KAI’s customer service department and asked them for a Kershaw Al Mar AM 3 clip and I use that for deep carry. The end of the clip that contacts the scale falls right at the edge of the lockbar cutout, so it’s not perfect, but I’m a big fan of it. Matt, Thanks for taking the time out to leave a comment! Glad you like yours as well. And good idea with the deep carry clip. That strikes me as a nice little upgrade! This was an outstanding review. I do like the design very much. I also own ZT knives. However, I fall into the category of the guy who wants a honker carry edc knife. For size, I don’t own a Sage. I carry the discontinued Kershaw 1840 stainless because I want a Yawara stick or I carry the Spyderco Endura. I get around the Endura clip by buying confiscated units that some people took off the clip. Yeah. I have a 0350 and others. I don’t carry the 350 because of the desire for a stick. The Buck 110 makes a good stick, but is too heavy to carry. Thus, the knife manufacturers are very happy to have me as a customer because I come close to buying everything, just not this model. Thank you very much. So glad to hear you enjoyed the review. It’s always cool to get a different perspective, and I try to see both sides of the coin but must confess my bias for smaller knives. That said, I still enjoy and appreciate bigger blades. And I’ve actually got a review coming up that will be right up your alley. I bought a Cold Steel 4 Max a few weeks ago and that sucker is BIG. I also want to pick up the SR1. Anyhow, I digress, but I appreciate the comment and promise to offer some big knives up for review in the not so distant future. I also recently received this knife (Ser. 11804). To me, the proportion of the knife is not quite right. Due to the light weight and narrow blade, I feel the blade length should be shorter. Maybe three inches or less. The pocket clip is not ideal for me, so I replaced it with an aftermarket deep carry clip that also slides on and off a little more easily. Unfortunately, the clip extends a bit beyond the end of the knife, which detracts from the aesthetics IMO. The screws are tapped into the titanium back-side scale, which some people do not like. Even so, I really like this knife as a gentleman’s folder, primarily because of the reasons you discussed. Thank you, Steve. Glad you liked this one too. Where did you review it? Good point regarding the screws being tapped into the titanium. I’m not sure if the knife would fit into my hand if it was much smaller, but I’d be curious to see what that is like. Great review! I just purchased this little knife to be my EDC. I’m currently carrying a sebenza 21 carbon fiber and I love the knife it’s just a little big for office carry. I should receive my zt tomorrow and can’t wait thanks to your review. Thank you, Rick! I hope you enjoy it. It’s a nice size for EDC. I’d be curious to get your thoughts after you had a chance to carry it. Thanks for the thorough review, Dan. I’d be interested to see how you’d compare it to the newly released and similarly sized ZT 0609. Jim, You are very welcome. Hmm, the 0609 wasn’t on my radar, but now that you mentioned it, the knife is a little smaller than I originally thought. I might just have to pick one up! Thank you for the suggestion. If one crosses my path I’ll buy it for review. Nice review, but then again I do enjoy your reviews anyway, written just the way I’d do it, if I could write. I bought the 0450cf back in January and enjoy it immensely. Nice and light (almost too light) and fits my medium arthritic hands just fine. I do find the cutting action not nearly as good as some of my other knives, but after touching up the factory edge, it does the job. The only concern I have is the carbon fiber. The stop pin sits between the two scales, but just how strong is CF? I use my knives to cut open meat boxes at work, beef boxes especially, that are very thick and strong. The 450cf struggles a little, requiring more force than my other knives, so I am a little worried about the strength of the stop pin. Sending it back to the States is not an option due to our border clowns. I have only heard of one instance that the CF failed and the stop pin flew out, but that could have been due to an over zealous user. Anyway, I will save my 0450cf to lighter tasks and let the “big dogs” do the harder stuff. I eagerly await your next review. Thank you very much for the kind words. So glad to hear you have been enjoying the reviews. 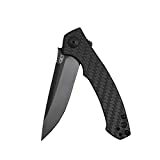 You raise a very interesting point regarding the 0450CF. Carbon fiber is supposed to be pretty strong stuff, but under a hard use scenario I’m not sure this would be my first choice for the reason you suggested. I wouldn’t want to test to see if the stop pin would bust out of the carbon fiber scale. I’ve been using my 450CF more like a gents folder, or a light duty EDC, and wouldn’t push it too far past that. You may be intrigued to learn I’ll be reviewing the Cold Steel 4Max next – that thing is no stranger to punishment! Thank for the review. ..I just ordered off Amazon for 140.00 bucks free one day shipping ( how can brick n mortar compete? ). I’ve been eyeing this knife for 6 months (since I bought 0804CF) and finally decided I “needed” one for my 50th birthday. It was between this knife and the Fox Tur carbon DLC (I’ll probably get both) and I went with this one because of the bearing pivot! James, Congrats on the new acquisition! Hard to beat the bearing action on a ZT folder. Enjoy yours in good health!